Back again.....of course, there is laundry to do, but this is much more fun! 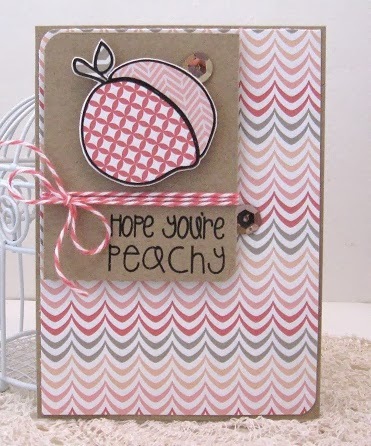 :) I am lovin' my new stamps from The Alley Way Stamps - Tooty Fruity and wanted to create one more card! This card was created based off of this week's sketch at RetroSketches - always such fun sketches! DP's and sequins from Teresa Collins/You Are My Happy, cardstock from PTI, misc. baker's twine and stamps from The Alley Way Stamps/Tooty Fruity. Wow, awesome colors and that's a funky cool peach. :) Love your designs! !